Please check for schedule & time updates @ vitragvignan.org , JSSYouth.org OR check the ustream link. It may be subject to change or canceled based on internet access from individual residences. Please find pictures of PPS Kanudadaji. The pictures were taken by JSS Youth during Dadaji’s stay in California. Please see the attached files showing the schedules of Aptaputras while they are in USA. Please take maximum advantage of their presence in USA by calling your friends, relatives and neighbours to have Swadhyay-Satsang with them and let them know about “Dada Bhagwan”, “Param Pujya Shree Kanudadaji” and ‘Akram Vignan’ and help them live a peaceful – blissful and meaningful life on this wonderful Earth… Thanks and JS! Dada Bhagawan Na Aseem Jay Jay Kar Ho. Jay Sachchidanand & shat koti pranam in your lotus feets. By Your grace programmes in UK are going on very well and beyond our expectations. We remember your words – ‘Khilva Do.’ We experience your pious presence & that we are simply instrumental in all happenings. We departed from Bombay on 2nd June. The London programme was arranged as follow by M. Anantbhai Mehta.Pl. find beneath UK Swadhyaya report for your perusal . Taking into consideration the interest shown by Atmarthis, Mumukshus and Mahatmas in London, Leicester & Manchester; we feel it would be prudent if your visit is planned in return from USA. Please click here to read the entire report. 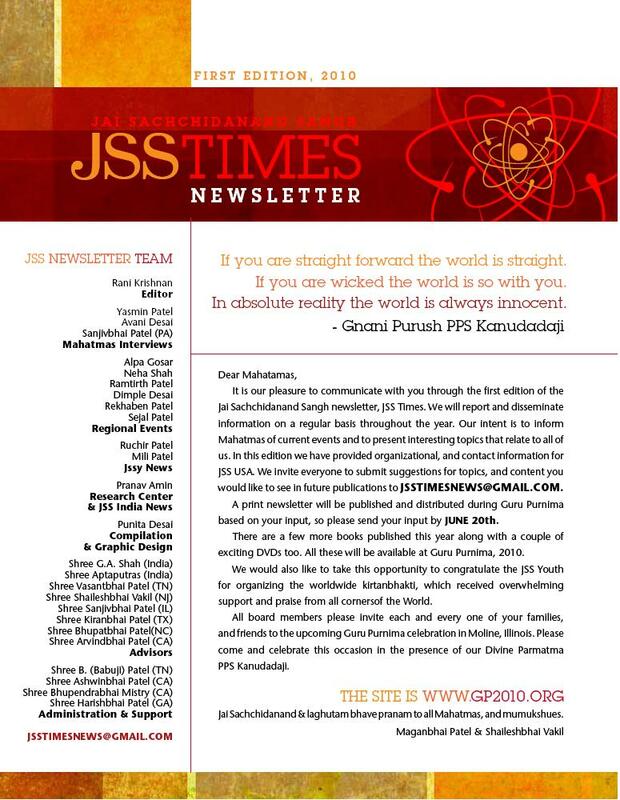 JSS Times Newsletter First Edition, 2010. Please visit Vitragvignan.org for additional information. To download a copy please click on the link below. How is your summer going? Come enjoy the serenity and peace of Dadaji’s presence this summer with our month full of LIVE SATSANGS!!! JUNE 13th – JUNE 26th. (Note: No Satsang on the 24th & Gyan Vidhi on 18th). Please check for schedule & time updates daily @ vitragvignan.org , JSSYouth.org OR check upstream link. It may be subjected to change. We yearn and strive to understand and idealize the one and only Vartman AtmaGyani Purush PPS KanuDadaji.